If a webcomic is intended all along to become a book -- if it's being created as a book, and put up online as a teaser or buzz-builder along the way -- is it somehow less of a webcomic? I'm sure there are webcomics purists who will insist it is: there are purists for everything, and we're probably all purists for something. But, realistically, what difference does it make? 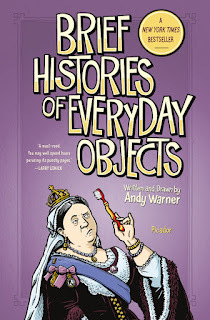 I discovered Andy Warner's Brief Histories of Everyday Objects before the book came out, when he was serializing the individual pieces online. I read it like a webcomic, was happy when I heard it would be a book, and (eventually) found and read the book. That looks like success, from an ex-publishing hand and still-marketing professional. That looks like the way it's supposed to work. Warner's introduction here doesn't quite say either way: he developed Brief Histories as "an idea for a comic." I think I've seen elsewhere that he had the book deal in place ahead of time...but maybe I'm making that up. (I like people to have book deals; it makes them happy, pays them for their work, and gets stuff for me to read. Win/win.) However it happened, Brief Histories was on the web, and it is now a book. 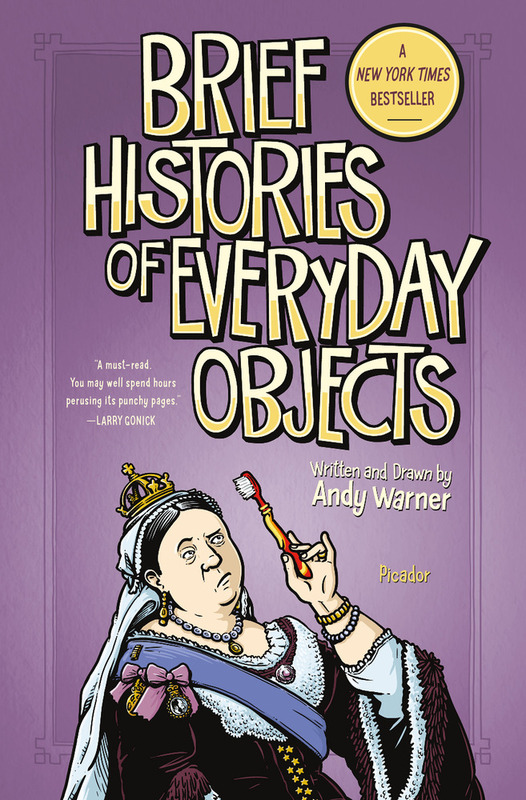 Warner gives the history, or a history, of forty-five random common objects, from toothbrushes to bicycles. Each one gets four pages, three and a half of them telling one main narrative, plus a few panels of "briefer histories" at the end for random fun facts that Warner presumably couldn't fit into the main story. These are not all necessarily the entire history of these objects, or even their original creation -- it tends to be a funny story that's reasonably close to the modern day, meaning a lot of 19th century and early 20th century inventors. To sum up: Brief Histories is funny, enjoyable, and, if you don't watch out, you just might learn something.